Moving services are an essential part of a quick move. Whether you were moving across the country as part of an internal job transfer or just moving across town, a good moving service could help reduce the stress of an already stressful situation. If you were operating on a short deadline or couldn’t move the heavy pieces of furniture that houses tend to accumulate, a service could make the experience, safer, more organized, and easier to manage remotely. Even better, moving services used to be tax-deductible under many circumstances if you were moving for your job. This benefit usually reached your wallet in two different ways: you could either deduct the costs of moving services and related moving costs yourself, provided you qualified, or your company was more likely to cover the costs because they knew they could process the deduction themselves. Even before the tax law changes went into effect, the best policy was to nail down what your employer would and wouldn’t cover before a move. So talk to them about moving expenses and get the coverage in writing. If you have to quickly transfer, most companies would rather have you in the new location without delay, even if it means additional incentives. Find moving companies that offer multiple services. When you’re moving, you need boxes and you need a truck or two. Even if you want to try packing up all of your possessions yourself, the sorting process will lead to a lot of stuff that you would rather donate or throw out than take with you. 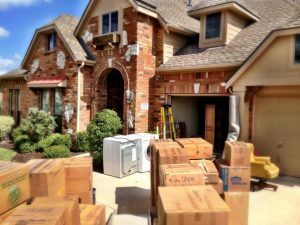 Going to multiple vendors and services will start to add up, so look for a moving company that offers all of the services you need, from supplies to packing to junk disposal, for a better deal. And, if you’re in the military, a permanent change-of-station move is still quantifiable for moving expense deductions. Call us at Brown Box Movers to get your move started.